“We want a trampoline!” If you have been hearing that from your children for months now, you may wonder, “should you get a trampoline?” If you aren’t sure and if safety concerns are one of the reasons you have been putting off getting a trampoline for your children, out In-Ground Trampoline experts explain that today’s in-ground and above ground trampolines are safer than trampolines in the past. Trampolines are a staple of fun in gymnasiums and backyards across the country. We’ll bet your community, or one nearby has an indoors trampoline space where that is all you do — jump on trampolines! Keep in mind that in-ground trampolines make owning trampoline ownership safer for everyone. If you’re still not convinced that you should get a trampoline for your children — and yourself — here are a few “facts” you may have heard about trampolines that simply aren’t true. We bust some of the trampoline myths you may have heard and which may have been true before safety was heightened for in-ground trampolines as well as above ground trampoline styles. They’re just for kids. Ask any adult and he will tell you that is not true! Not true! An in-ground trampoline is fun for the entire family. Your trampoline can become part of the family’s fitness equipment and can amp up your workout routine. They have no style. Trampolines, especially in-ground trampolines have style and they also don’t detract from the beauty of your current landscaping. You can also invest in a round or a rectangle trampoline. Sure, an above ground trampoline will be visible, but if you want one and if your children have talked you into one, you won’t care if you see it in the backyard! They’re expensive. As with any piece of exercise equipment or even any equipment your children may want — playground in the backyard for example — the prices vary. You can plan to spend anywhere from a few thousand dollars on up — depending on the size, shape and style. 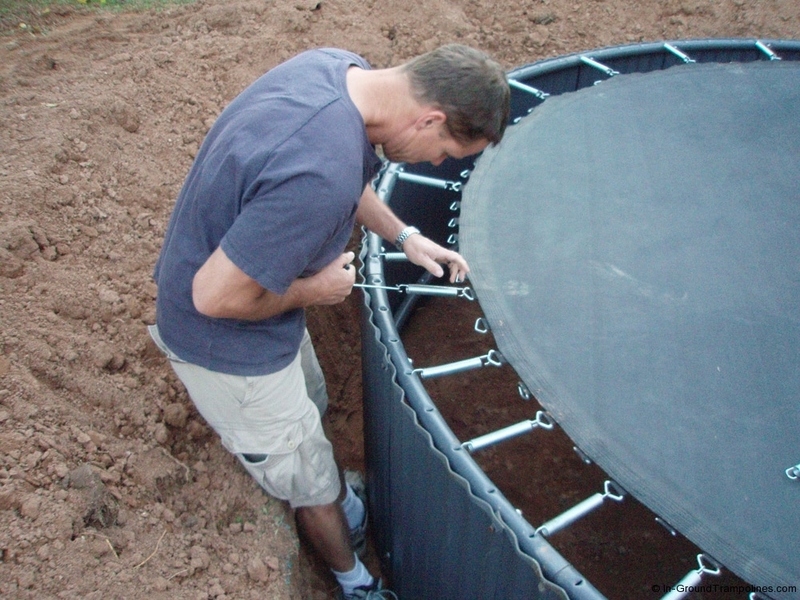 You don’t want to skimp on your in-ground or above ground trampoline purchase because you could be skimping on safety. Work with an experienced trampoline salesperson to assure you’re getting your money’s worth and that you’re investing in a trampoline that will serve your family for many years to come. Iou’re considering an in-ground trampoline this year, check out our in-ground trampoline FAQs before you make any decisions.